You’ve probably seen Sophia, a “realistic” robot created by Hanson Robotics that has garnered a lot of attention in the media. That attention is supposedly a result of how lifelike it is, but the more likely reason is that it creeps people out and that’s interesting. Sophia fits squarely into the “uncanny valley” that’s notoriously disturbing to humans. But, if that interests you, you can now back a Kickstarter campaign for Sophia’s little sister Little Sophia. Little Sophia is programmable, and, unlike the larger Sophia, can actually walk around. Like Sophia, Little Sophia can talk, sing, and tell jokes. 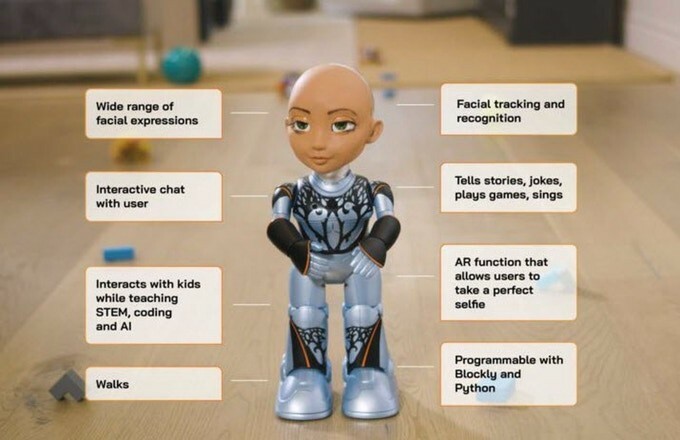 Little Sophia has an expressive face, and has facial tracking and recognition of its own. Children can program Little Sophia with either Blockly or Python. Hanson Robotics’ stated goal is to get girls interested in STEM — specifically robotics and programming. Of course, that only works if your kid isn’t too creeped out to play with Little Sophia. If you’re interested, Little Sophia is actually surprisingly affordable for super early birds (today only) at $99 plus shipping, and $149 thereafter. The Kickstarter campaign is running until March 31st, and rewards are expected to ship in December 2019. Sophia the Robot’s Little Sister Launches on Kickstarter was originally published in Hackster Blog on Medium, where people are continuing the conversation by highlighting and responding to this story.